The London gallery Purdy Hicks (working in tandem sometimes with the German publisher Hatje Cantz) has hit a vein of tremendous photography from Finland. A large enough number of artists associated with the Helsinki University of Art and Design have developed for it now to be possible really to speak of a ‘school’. Indeed, the gallery has recently shown and the publisher recently published several times on the Helsinki school as a coherent group. The current (Spring 2012) show at Purdy Hicks is of splendid landscapes by Sandra Kantanen, also the basis for a book published by Hatje Cantz. I hope to write about these, too, before the show is over. It’s a familiar experience to be in a gallery or museum and to have to bend one’s knees and crane one’s neck to avoid the harsh glare bouncing from the shiny surface of a painting. I had always thought it a mildly irritating experience: why can’t these people take more trouble with their lighting? Now a photographer of great imagination has taken that simple experience and turned it into the main subject of a thoroughly exciting series of pictures. Jorma Puranen has for some years been a distinguished professor of art in Helsinki, and as such is often cited as among those responsible for what amounts to a golden period in Finnish contemporary art photography. One way to describe his own practice is to say that he has worked at a remove from straight photography. He achieved a previous lovely series by painting a rough surface shiny black and photographing the landscape reflected in it. 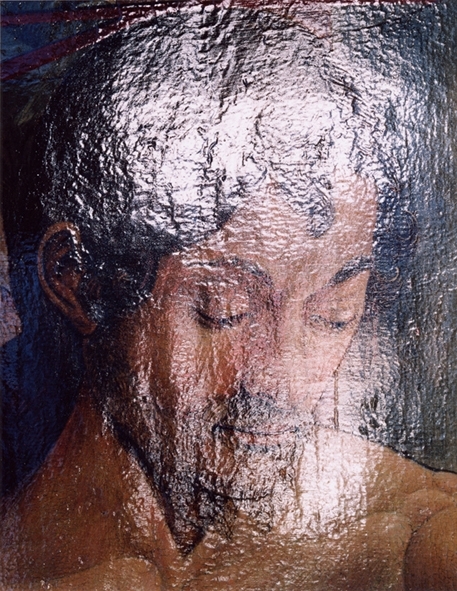 The new series applies similar principles to a group of paintings. 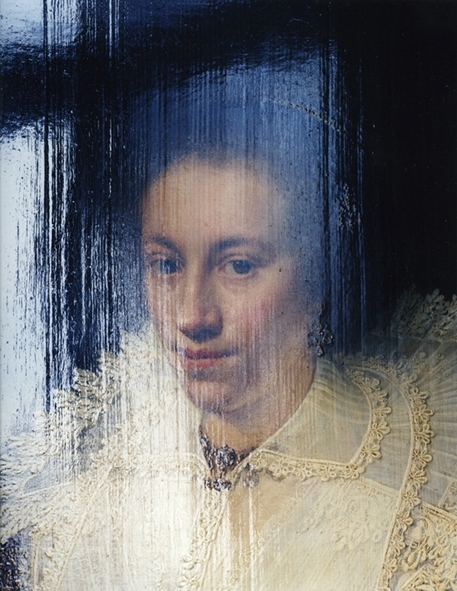 Puranen has deliberately sought the glare of light and manipulated it to make a veil or curtain through which we have to peer to see the paintings beyond. We’ve all made photographs which are spoiled by the shine off the surface that we wish to see. Yet in Puranen’s hands we’re miles from those plain errors. He composes with light, blending it into different consistencies and colours. Sometimes he makes it a gauzy sheen, sometimes an impenetrable solid block. It can be harsh or feathery, a flavour in its own right or a condiment to lift the flavours it touches. Puranen’s light is a perfectly proper photographic effect, as much so as the sprocket marks Cartier Bresson liked to leave on the edges of his prints. All photographers deal with light, all the time. Not many dare to treat light as their actual material. 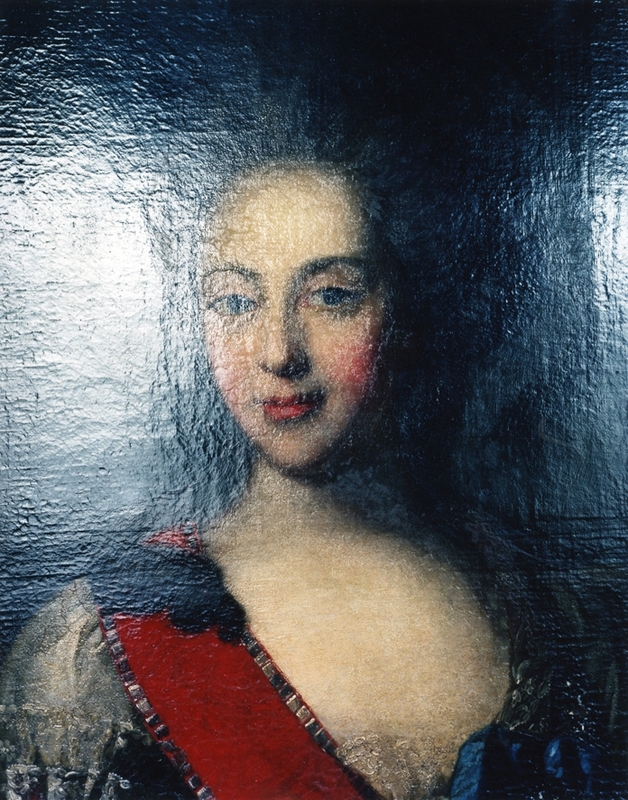 The paintings Puranen has chosen are a group of mainly Netherlandish portraits in oils of the seventeenth century, although I was proud to spot a mildly anomalous Pollaiuolo in there, too. He brings them to us with names of neither painters nor sitters. They share dark backgrounds which serve Puranen’s purposes well, and they all have a single sitter isolated within the picture space. Almost all were like that when Puranen found them: not for him the nice photographic game of finding overlooked but interesting figures in obscure corners of paintings. But they are overlooked all the same. 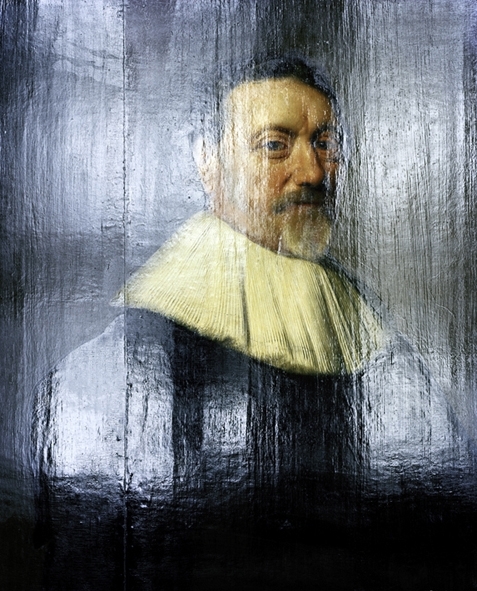 Old master portraits en masse are not thought terribly exciting by most people, and lots of museums all over Europe have long rows of Dutch portraits getting no more than passing glances. This is Puranen’s real subject. 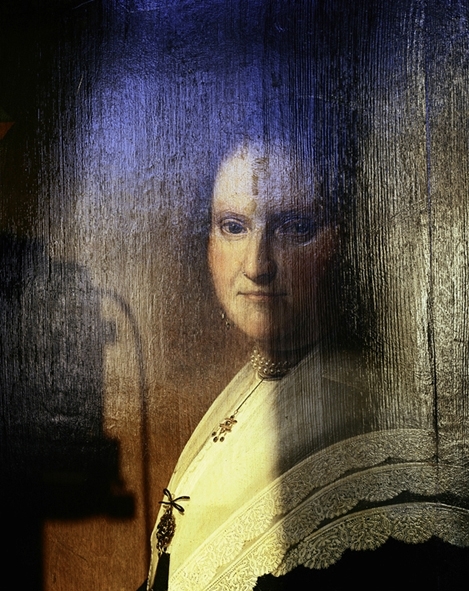 He has found a way to bring these portraits back to life. As he once put it in an interview, the act of photographing became a form of knocking on the frame to ask if there was anybody within. 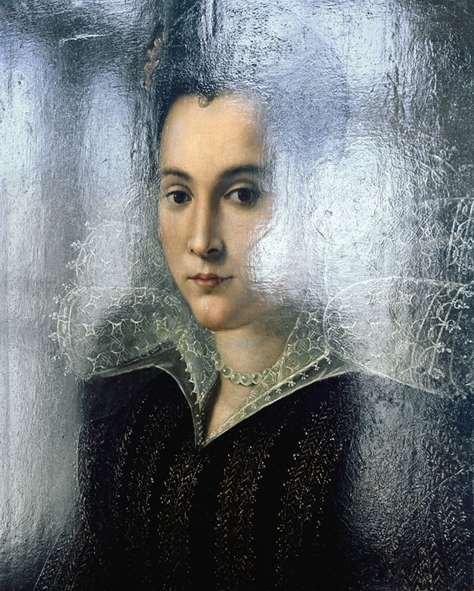 Using daylight only, Puranen draws a curtain around each portrait which he then partially pulls back to invite us in. The principal effect is to find joy in the many textures in each picture. Flemish paintings are particularly good for surfaces, and Puranen dives headlong into that pleasure: here are Mechelen or Cambrai lace, velvet, and coarser cloths like broadcloth with accents of knotted rep. There are the many textures of skin, too. All that’s before he starts to explore the textures of representation itself: light bounces differently from board or canvas, from brush strokes applied with bravado or careful dabbing. In one picture an impenetrable flood of reflected light is punctured only by the half dozen blobs of a necklace in the original painting, poking through like a string of volcanic islands in a glassy sea. 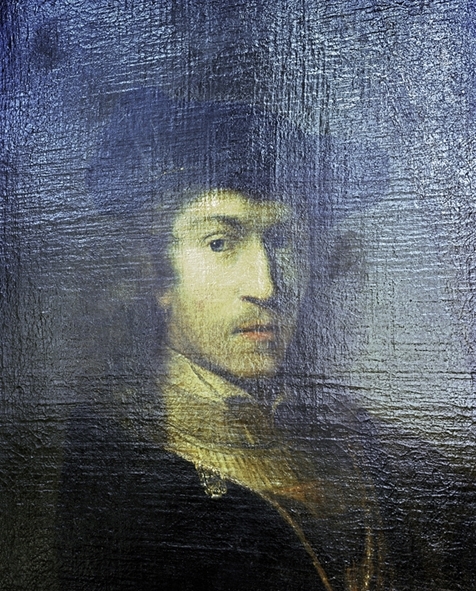 In another the craquelure on the surface of the paint has become a rather Dorian Gray-like commentary on the beautiful complexion it depicts. 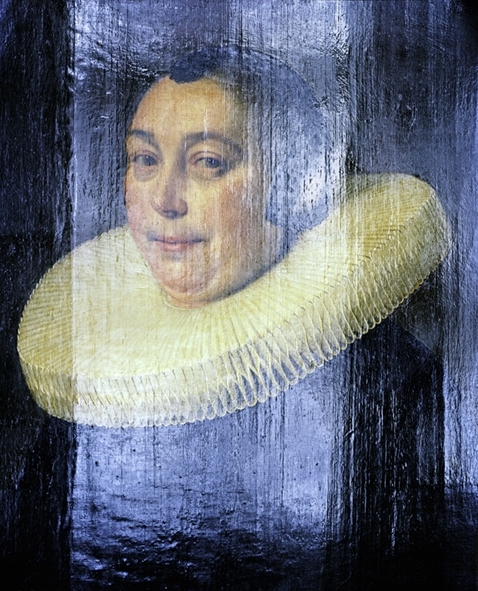 Two of them are in fact of the same portrait revisited, a stern looking Mevrouw with scallopped lace on her shoulder and a pendent necklace. In one version, she peers over a solid wall of light which reaches almost to her eyes and looks like nothing so much as a modern Moslem veil. But it takes a fifth and sixth look to notice that she is the same: Puranen’s treatment is not automatic or formulaic, and he can make thoroughly different art works from the same original just as good photographers have always been able to make widely different prints from the same negative. There is tremendous respect in this treatment of Puranen’s. Photography so often overwhelms its subjects. Photographs are accurate, and can scream that accuracy too loud. Not here. Here the finished emotion in the viewer is compounded of elements rooted equally in the original painting and in the photograph. The gravitas of the portraits is certainly an element, but it’s a gravitas rebuilt not merely borrowed. The particularly Flemish accuracy of the different ways light strikes different surfaces is echoed by the raking glare of Puranen’s light. If it took virtuoso skill to paint a ruff of a thousand folds, it takes no less to make something new out of that with light. This is not merely accurate photography of existing art: Puranen’s miracle is to use the same glare both to hide and to reveal. He has found a way of paying his tribute to masters of light in their own currency, light itself. This entry was posted in Photography and tagged Hatje Cantz, Helsinki University of Art and Design, Jorma Puranen, Purdy Hicks, Sandra Kantanen by Francis Hodgson. Bookmark the permalink.